This pastel drawing utilizes a more abstract technique in depicting a portrait of a Saluki. I drew in the black pastel first to create both the background and to develop the shadowing once the white pastel was applied. 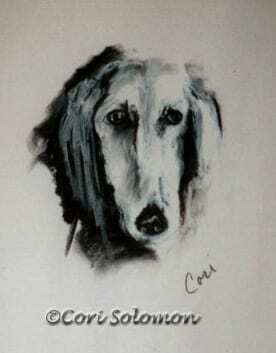 This Saluki drawing won First Place in the drawing category at The Art Show At The Dog Show in 2002. This pastel drawing is framed.